Advanced Web Offset is equipped with two Model 335 stitcher, with a total of eleven signature pockets and two cover feeders that may be configured between the two lines as required. Muller-Martini is one of the most respected names in bindery equipment. They are the leader of stitching lines, they provide clean, square cuts, tight stitched and a properly stacked finished product. Advanced Web Offset is capable of saddle stitching and trimming up to 224 pages of newsprint from one up to seven signatures plus a cover at speeds up to 12,000 complete books per hour. We are never down due to mechanical breakdown. Multi lines allow us to mix and match feeder pockets and other parts for redundancy. We can assure you that your saddle-stitched publication will be delivered on time and that you will be very pleased with the finished product. Five Pockets into each jacket or master section. 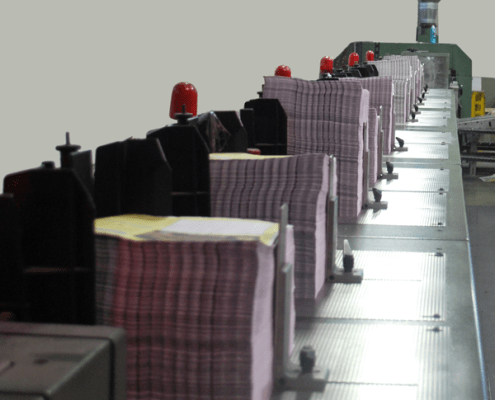 Speeds of over 12,000 inserted pieces per hour and handling insert sizes across the board from reply cards to full newspaper advertising inserts to booklets. The Muller 227 is the work-horse of the industry for efficient insert handling. Our machine is ready to package your job needs per your specification. Our 1530 Panda Binder II has 18 automatic feeding stations, we can handle your large to small perfect bound products. With our inline trimmer, we can bind your publications with speed and accuracy. Our skilled machine operators will give your products the “White Glove” treatment. Our Polar Cutter is capable of pre-programmed stages cuts up to 30 stages per set. The Polar name is the Cadillac of the printing industry. Equipped with side air tables and the best safety features, the Polar cutter can easily slice through any six inch stack that will fit in its wide 45” mouth. Clean, straight and fast, the Polar is capable of fulfilling any off line cutting needs your job may require. For your folding needs our MBO folder is equipped with photo cells that measure the sheet length and automatically adjust the suction length and sheet gap, this allows for accurate and square folds. Included is a electronic multifunctional batch counter, to assure final count accuracy on all your products.